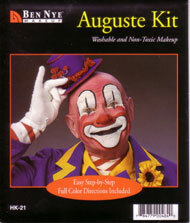 Auguste Clown Makeup Kit. The ultimate for theatrical or masquerade easy-to-do character makeup designs. Each kit comes with a detailed step-by-step set of instructions and quality Ben Nye components. Nye's créme makeup is easy to blend and quick to remove. Kits in this series will do 4-6 applications.